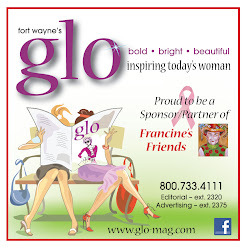 Francine's Friends: Emmy Nominated "Life with Friends" video premieres on ABC 21 Alive! Emmy Nominated "Life with Friends" video premieres on ABC 21 Alive! Francine's Friends is excited to have the opportunity to share Emmy nominated "Life with Francine's Friends" with the 21Alive viewing area on May 21st! The short film will be shown commercial-free, in its entirety on Tuesday, May 21st at 10:30am, 12:30pm and 7:30pm on ABC 21Alive. "Life with Francine's Friends" stars Robyn Scott and Colleen Murray, of Chicago's Second City, along with Francine’s Friends mobile mammography founders, partners, board members, funders, sponsors, table captains, community supporters, breast cancer survivors and a host of other “friends”. The video was created locally by PUNCH FILMS, in association with Francine’s Friends, Inc. and Emley Design Group, and was produced by PUNCH's John Cuneo and Derek Devine. It was filmed locally at Toscani's Pizzeria, Fort Wayne Urban League, Scotts Foods and TrendSetters Hair Design. "Life with Francine's Friends" was nominated for an Emmy in 2012. Viewers will have a chance to ride along with best friends “Jill” and “Karen” as they learn more about “Life with Francine’s Friends” after Karen gives Jill a mammogram appointment on the coach for her birthday. Francine’s Friends and “friends” all help equip Karen with ammunition about early detection and mammography screening. Will it be enough to convince Jill to "get on the coach"? There’s only one way to find out! The film premiered at the 2011 "Lunch with Friends" annual fundraiser, and has been shown in Indianapolis and telecast on Comcast in the Chicagoland area. Please encourage your friends, family, co-workers — and everyone else you know — to share this opportunity with their friends and tune in on May 21st! Note: Will be presented without commercial interruption. Click here to view behind the scenes photos during the video shoot.